Mons only recently came to the attention of the Guru's once it became the European Capital of Culture in 2015 and here is our guide to the best places to stay in Mons. Being the European Capital of Culture in 2015 alerted many of us about its collection of entertaining museums, it’s beautiful medieval centre and Grand Palace and the wonderful Ducasse de Mons of Doudou festival - a glorious week-long occasion with parades, golden carriages, mock battles between St. George and the dragon and plenty of beer. The beautiful central area - Grand Palace. Our Guru’s recommendations for the best places to stay in Mons are centred around the Grand Palace and the Gothic-tastic Church of Saint Waltrude. Dream! 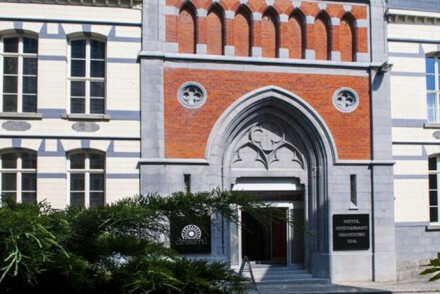 is a wonderfully unique hotel in a converted chapel right in the heart of Mons. While the building itself is wonderfully historic, the decor is exciting and contemporary and each of the 57 rooms is different. Rooms start from round £80 per night. Mons is at it's warmest during the northern hemisphere summer, from May to September the temperatures vary around 18-23 degrees. This former chapel in Mons city centre has cleverly combined the heritage of its past with contemporary design. Rooms are all unique with exciting furniture, original church windows and vibrant colours. There's also a gourmet restaurant, bar and brasserie, plus a spa is on offer for a small fee. Sights nearby - Visit the 15th Century Gothic town hall. Dream is ideally situated in Mons' historic centre.